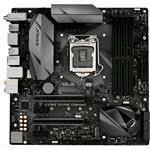 ROG Strix Z270G Gaming motherboards combine bold aesthetics with premier performance and incredible audio to deliver unrivaled gaming experiences and style. Support for the latest Intel processors and technologies,plus exclusive ROG innovations,take performance to the next level to give you the edge against opponents. ROG Strix Z270G charges every movement of every game with thrilling energy and equips you with epic speed and agility.